This is not your grade school book cover! If you carry it with you, you can wrap it up. Those beautiful fabrics can be a part of your everyday life. 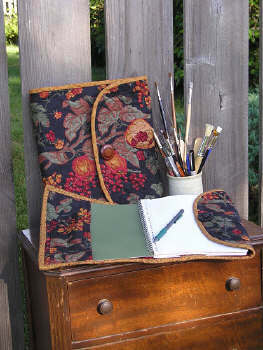 Just quilt up a cover for your day-planner, your journal, your sketchbook, even your Bible. Choose a fun fabric, add a 3 or 5 subject notebook (5 Star from Mead is my favorite) and a matching pen for a unique and affordable gift!